Whenever you are working in your garage or looking for something that you stored in it months ago, it always helps to have better illumination because traditionally there are few or no windows in garages that can let in natural light. In these situations, LED garage lights are the best solution. Rather than incandescent lighting, LED lights are brighter, energy efficient, and have a longer lifespan. The following guide lists some of the best LED garage lights. We have prepared this list after extensive research while comparing the various features and qualities of different products. 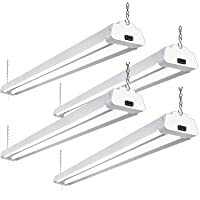 The Hykolity 4FT 42W Linkable LED Shop Light with Pull Chain for Garage (4 Pack) is the best LED garage light as it is durable, has a long life span, and is energy efficient. The Hykolity LED Shop Light is one of the best-LED garage light as it has a staggering LED efficiency of 88 lm/w which means 3700 Lumens at 5000K Daylight White. This 42W Shop Light provides long lifespan, high performance, 5-year warranty, and energy savings in a simple conventional lighting fixture. This fixture is highly durable as it is made from composite aluminum. The pull cord on/off switch makes it very simple to power this fixture. 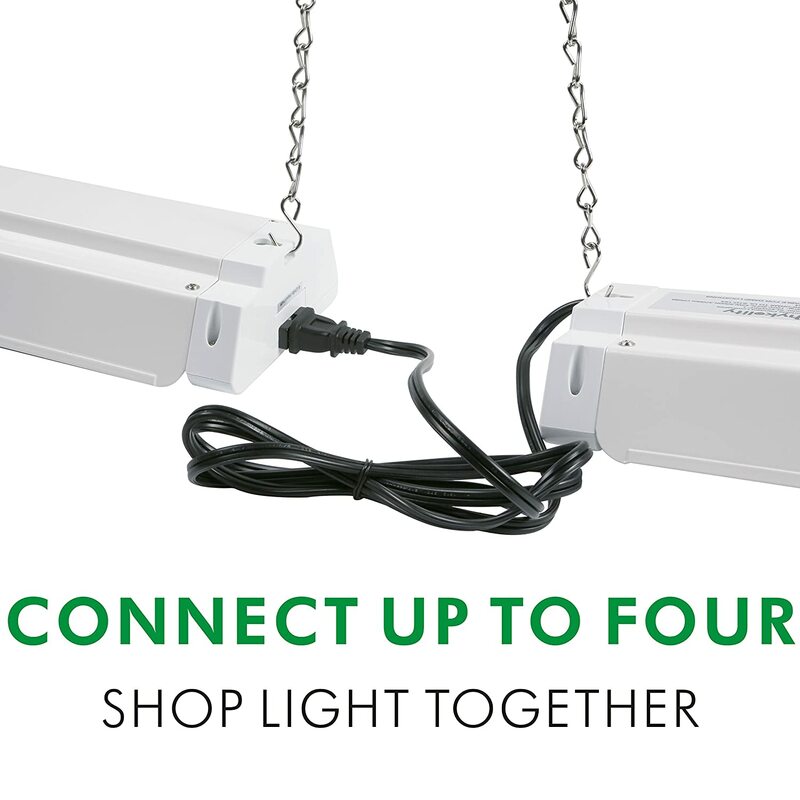 Hykolity LED Garage Lights connects up to four shop light together. The Hykolity LED Shop Light has a wide application which makes it is suitable for different areas such as garages, workbenches, warehouses, workshops, work areas, basements, storage rooms, industrial workstation, equipment room, factories, utility and recreation rooms, and barns. They are particularly helpful in lighting large areas. 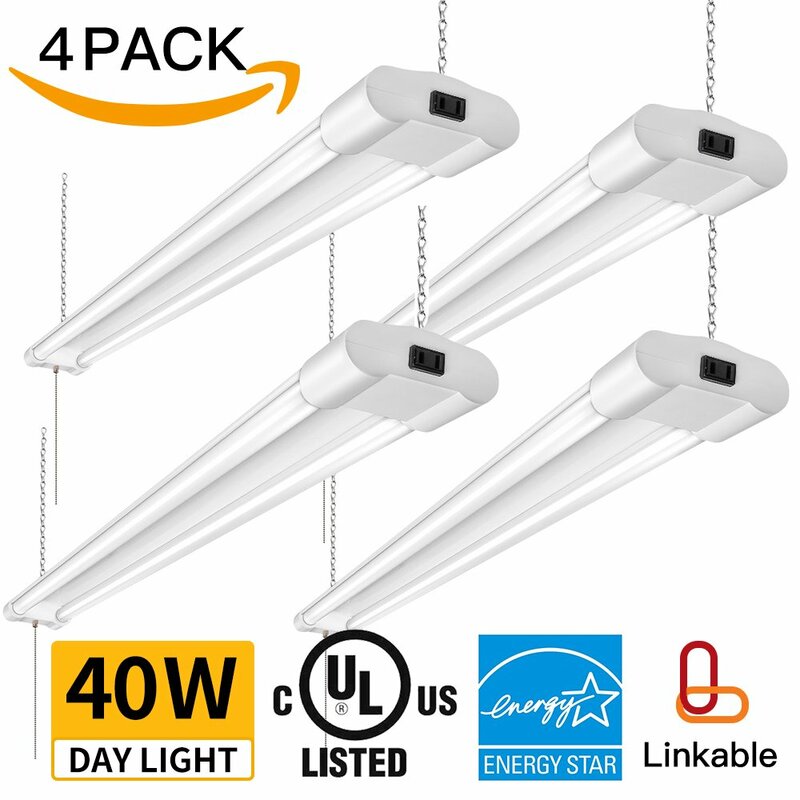 The AntLux 4ft 40W 4400LM 4500K Neutral White LED Garage Light (8 pack) has some great features while providing the best value for money which makes it one of the best LED garage light. The AntLux 4 ft. Neutral white LED garage light makes it to our best LED garage light list as it provides energy savings, high performance, and a longer lifespan for general use. 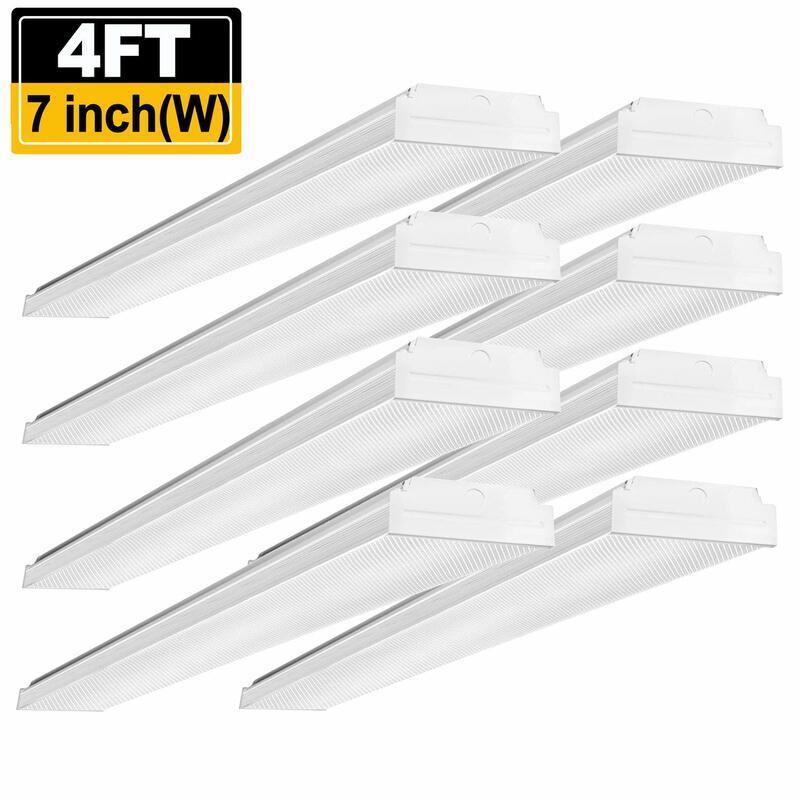 These flush mount LED garage lighting emits over 4400Lumens. With 50,000 hours of maintenance-free operation, these lights come with an exquisite acrylic cover that provides uniform illumination and maximum light output. The AntLux 4 ft. Neutral white LED garage light will knocks out the hole on end assemble the lights in line. 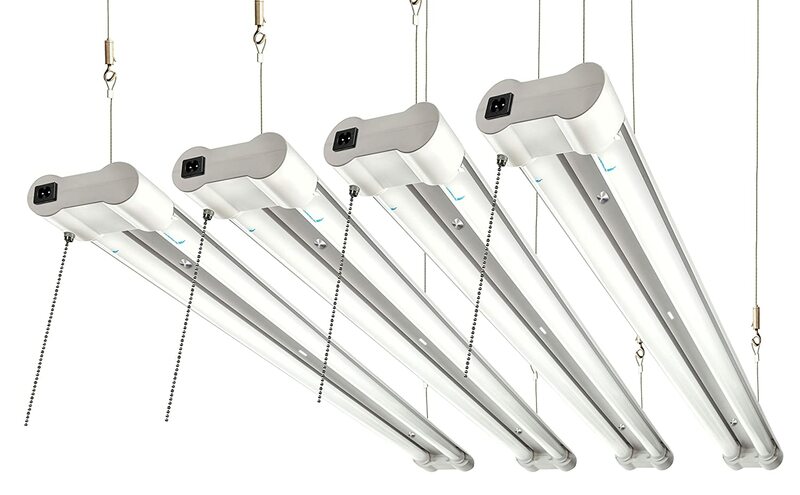 The AntLux white LED garage wraparound light are a healthier, cheaper, and brighter lighting solution than fluorescent and incandescent light fixtures. They are perfect for use in various places such as garages, auto shops, laundry rooms, hallways, schools, closets, hospitals, workshops, basements, industrial workstations, etc. 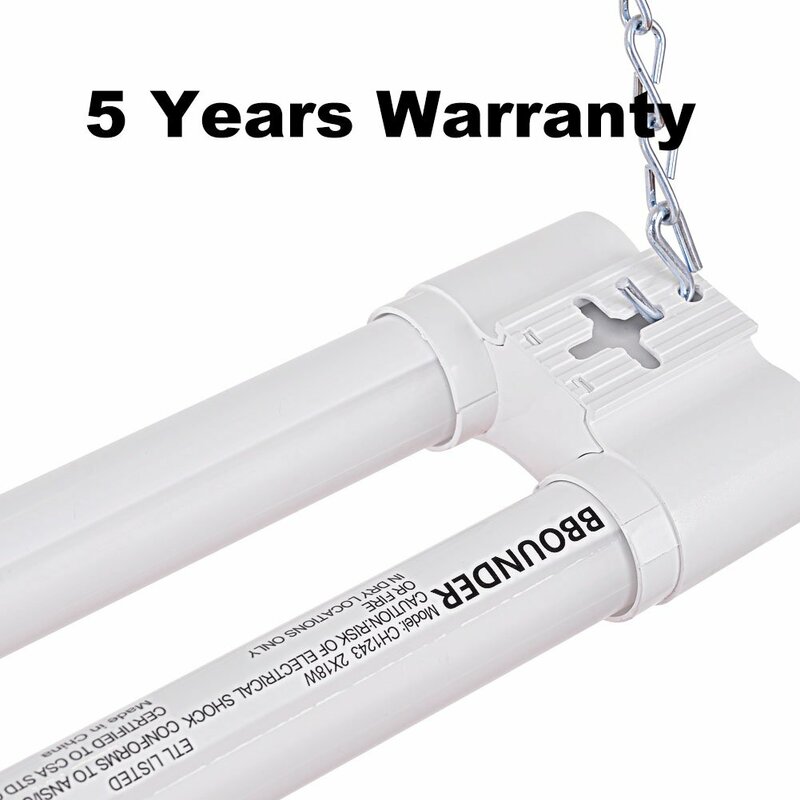 When it comes to performance the BBOUNDER 42W Linkable 4FT 5000K Daylight Super Bright LED Garage Light is one of the best LED garage light as it is ideal for both residential and commercial use. 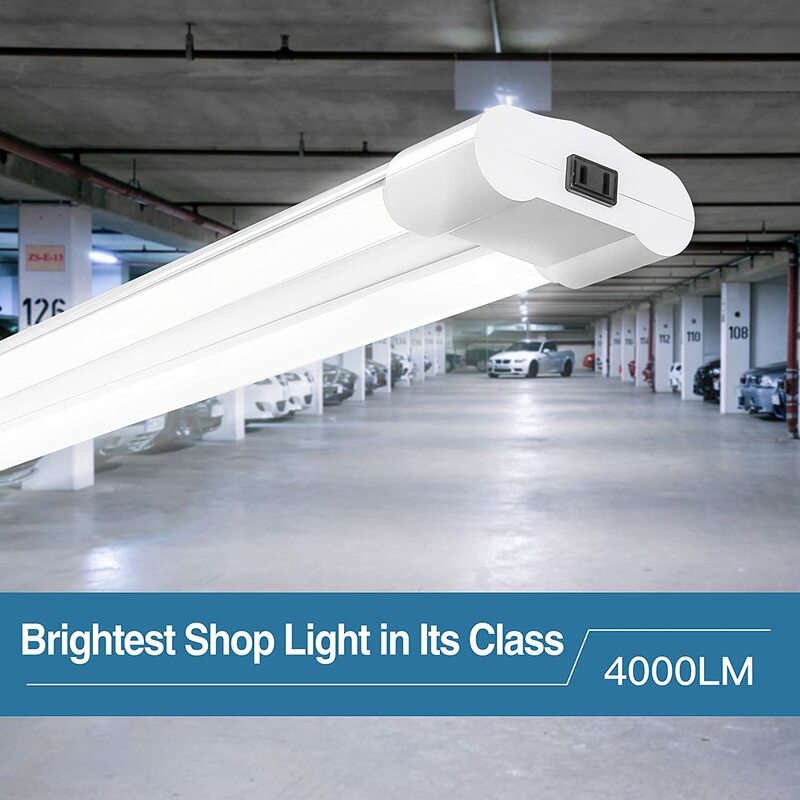 The BBOUNDER 42W daylight super bright LED garage light is on our top ten best LED garage lights list as it helps to fulfill your lighting needs in vast applications due to their high brightness level. 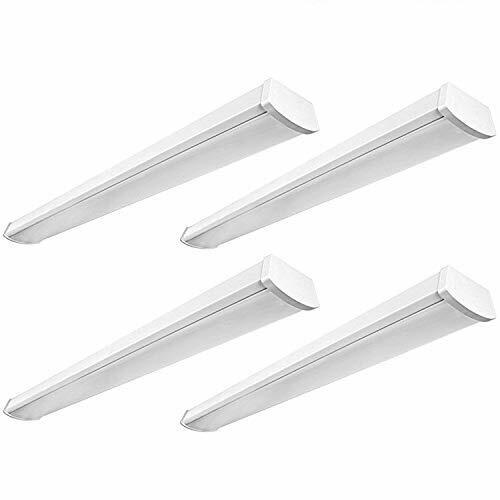 These lights have a smooth cover that helps in uniform light distribution. The BBOUNDER LED garage light has been constructed to enhance lighting durability with the help of an impact-resistant lens. 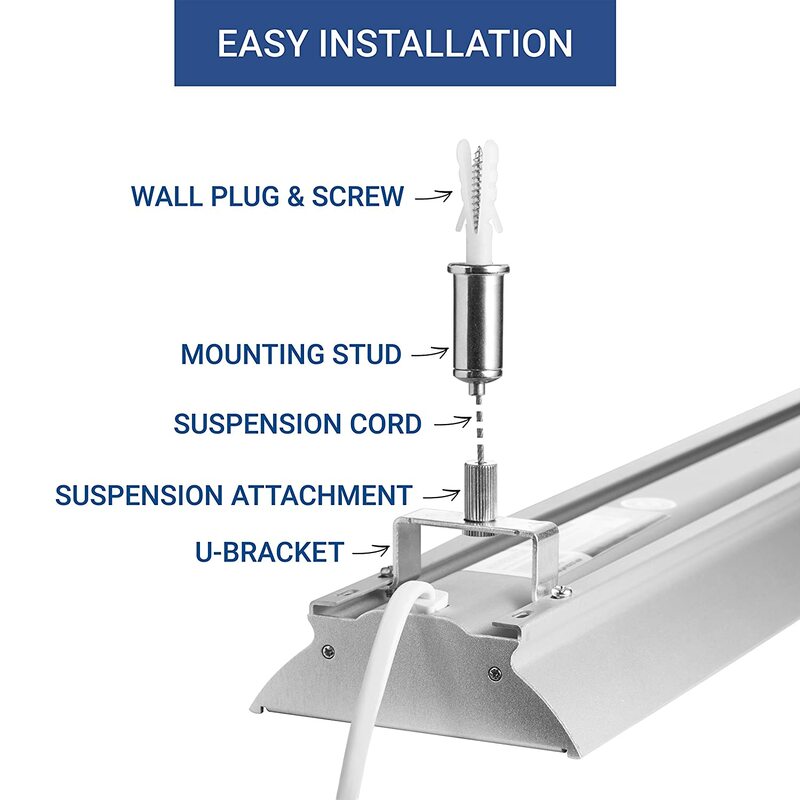 The hanging hardware for BBOUNDER super bright LED garage lights provides easy installation for both suspended and flush mounting. 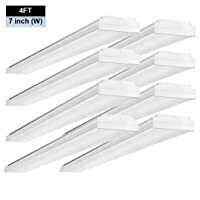 These lights have a smooth cover that helps in uniform light distribution. The BBOUNDER super bright LED lights are perfect for both commercial and residential lighting. They are also ideal for garages, offices, stairwells, workbenches, kitchens, hallways, utility rooms, laundry rooms, recreation rooms, etc. The Amico LED garage lights are environment-friendly as they do not contain mercury or UV. The ultra-lightweight design is very easy to install. The Amico ECO utility linkable garage lights are designed to shine ultra-bright while cutting down on bulk and weight. These fixtures deliver up to 4000 lumens of light easily replacing your existing ceiling light fixture. The Amico LED garage lights are environment-friendly as they do not contain mercury or UV. The ultra-lightweight design is very easy to install. The Amico LED garage lights are the brightest shop lights in its class. The Amico 40W linkable LED garage lights are perfect for garages, basements, workshops, warehouses and other large residential and commercial areas that require efficient lighting. These garage lights ensure durability, safety, and prevent asthenopia. The BBOUNDER LED garage lights provide daylight white light to illuminate the whole area. These garage lights effectively reduce the electricity bill by delivering 3600 lumens at 36W. The BBOUNDER LED garage lights are highly efficient at providing LED illumination for up to 50,000 hours. 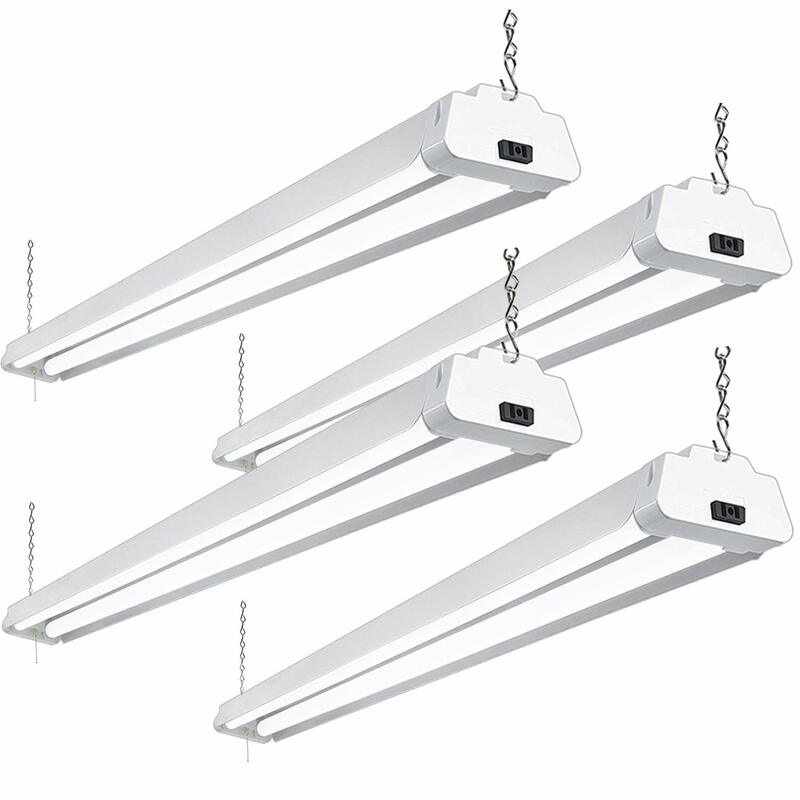 Equivalent to 100W traditional overheads the 36W beaming makes this fixture highly durable. These garage lights also offer hassle-free installation with both flush and suspended mounting option. The BBOUNDER 36W LED garage lights can be installed in various areas such as garages, storage rooms, workbench areas, recreation rooms, warehouses, basements, equipment rooms, workshops, etc. These bright LED lights are perfect for any area that needs brightening. The OOOLED 42W LED garage light provides 4800 lumens at 5000K daylight white. These garage lights dramatically reduce your electricity bill. 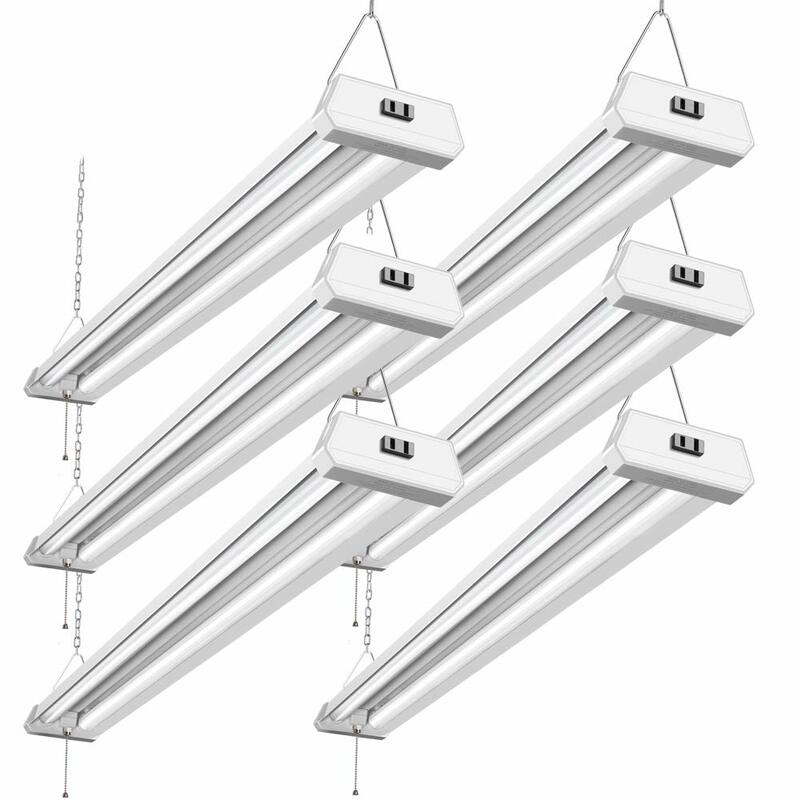 Natural white light offers the best lighting experience that is ideal for general area or work bench lighting. These garage lights come with the option of flush mounting or hanging mounting. You can use a plug connection to link up multiple lights with the help of daisy chains provided. The pull cord on and off switch is also provided for easy operation. The OOOLED 42W LED garage light provides 4800 lumens at 5000K daylight white. The OOOLED 42W LED garage lights are ideal for auto shops, carports, garages, basements, barns, utility and recreation rooms, industrial workstations, etc. Hassle-free installation ensures that it does not take more than a few minutes for you to install it in any place that needs brightening. The CACKSS 4ft. LED garage lights provide a simple, maintenance-free solution to indoor lighting areas. 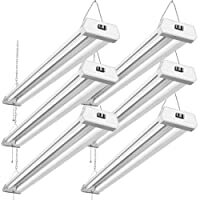 These LED lights provide staggering LED efficiency of 120lm/w and 5000K natural daylight thus providing super bright lighting while saving energy. The three prong plug provided with these lights protects you from any electric hazards while using these lights. The CACKSS 40W garage lights have a lifetime of 50,000 hours and help you save your energy costs. 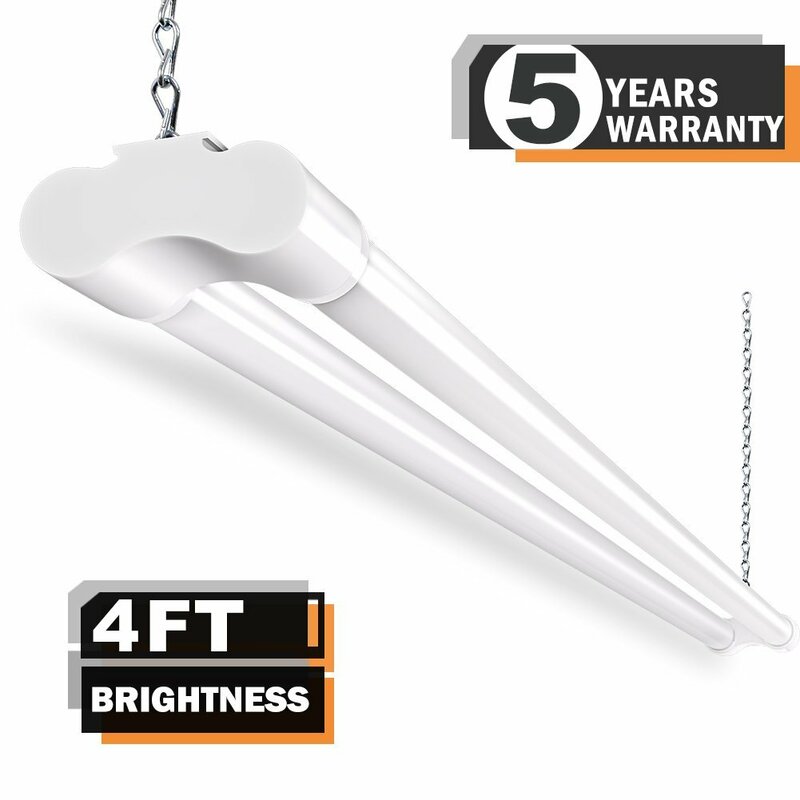 The CACKSS LED shop light for the garage is ideal for large areas that require illumination. It is also a perfect choice for basements, garages, workspaces, storage rooms, workshops, etc. 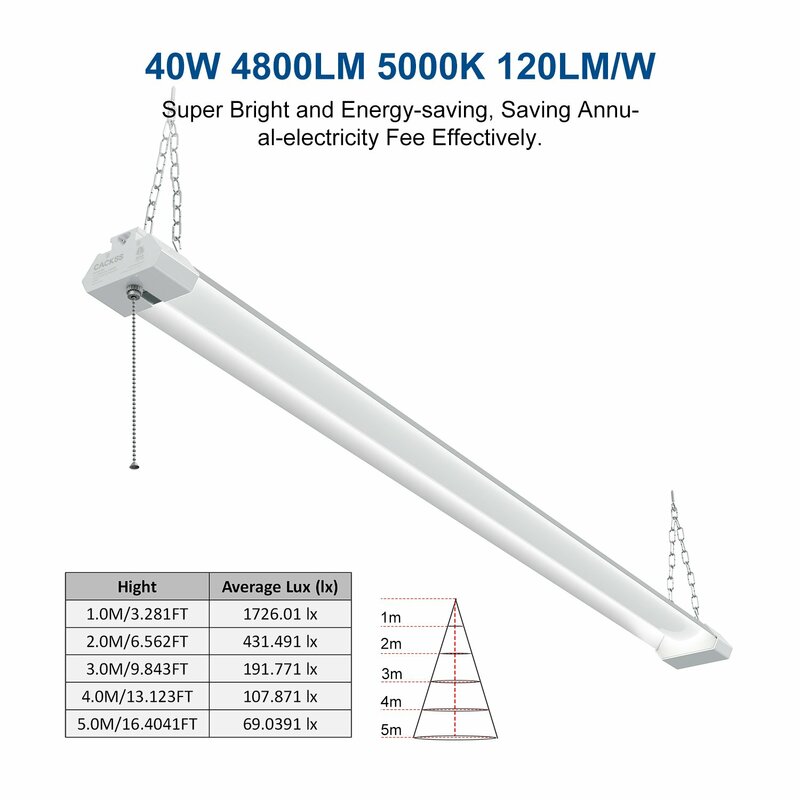 The lamps last up to 50,000 hours thus eliminating the need for replacement. The CACKSS LED garage lights are ready to install as they come with hang hardware and pull cord on/off switch. 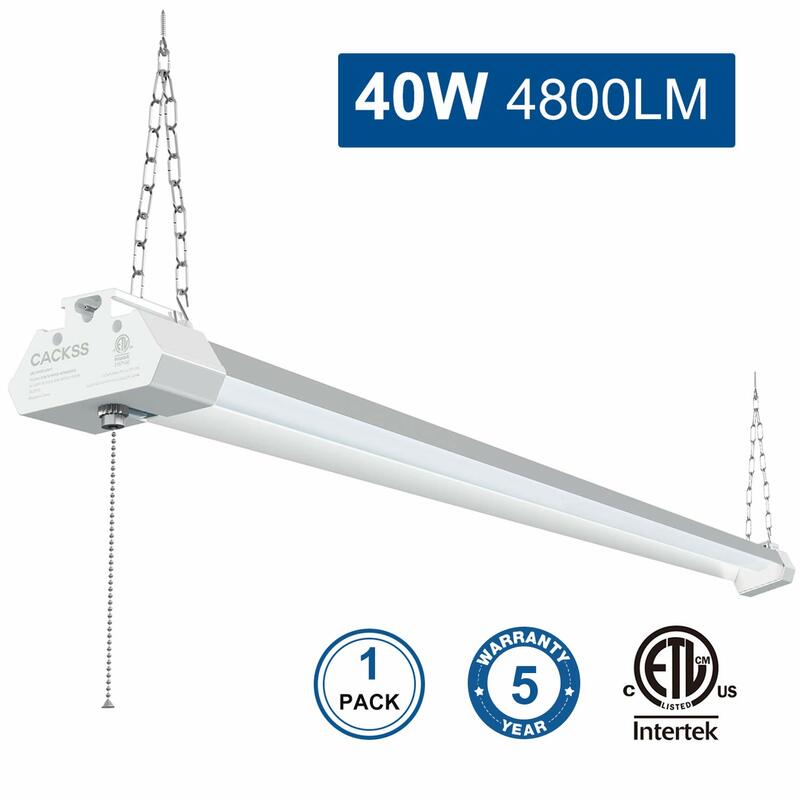 The Hykolity 40W linear LED garage lights help you to enjoy energy savings of up to 65%. These lights provide 2800 lumens output at 40W thus offering high brightness to fulfill your lighting needs in large areas. The 5000K daylight white helps you to conserve energy. The integrated LED lights ensure that you will never have to replace a bulb again. The Hykolity wraparound ceiling fixtures can be easily surface mounted to walls and ceilings with the help of included mounting hardware. 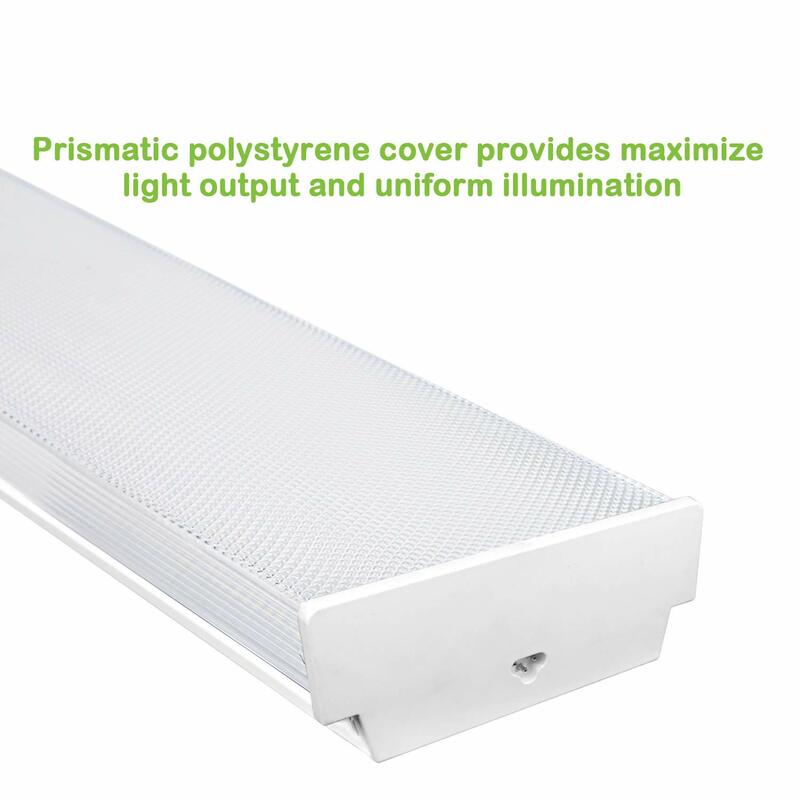 Hykolity 40W linear LED garage lights have prismatic polystyrene cover provides maximize light output and uniform illumination. 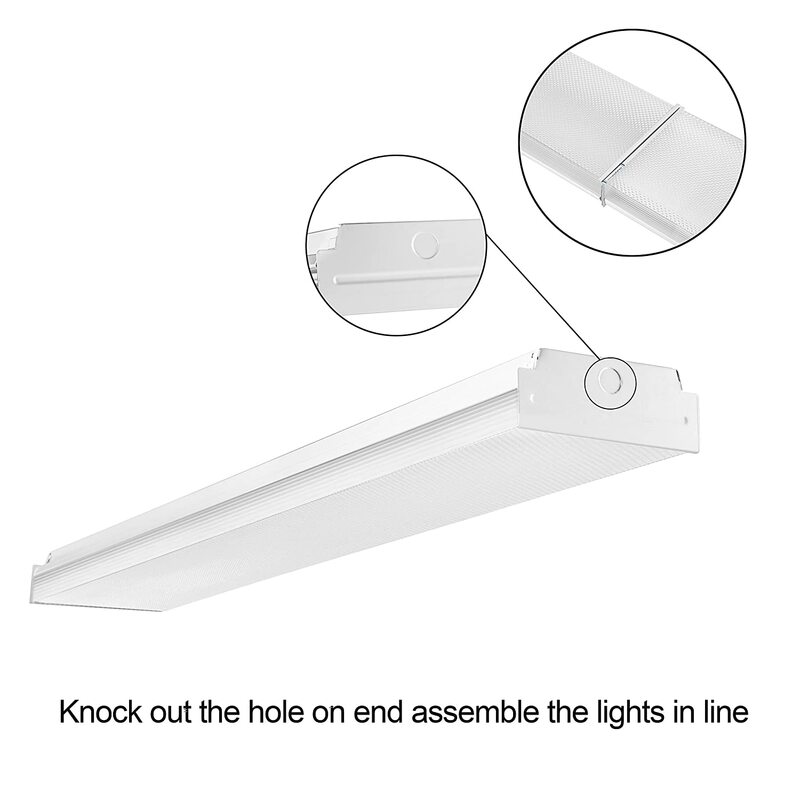 The Hykolity LED garage lights are safe, long lasting, and efficient which makes them perfect for different locations such as garages, under cabinets, closets, stairwells, offices, workbenches, basements, etc. Now you can save up to 62% on your electricity bill by replacing your old fixtures with the Hyperikon linkable garage lights that consume only 38W. These garage lights have an astonishing life rating of 45,000 hours which means that now you can forget about replacing your bulb. The Hyperikon have an output of 3800 lumens thus making them brighter than most fixtures. 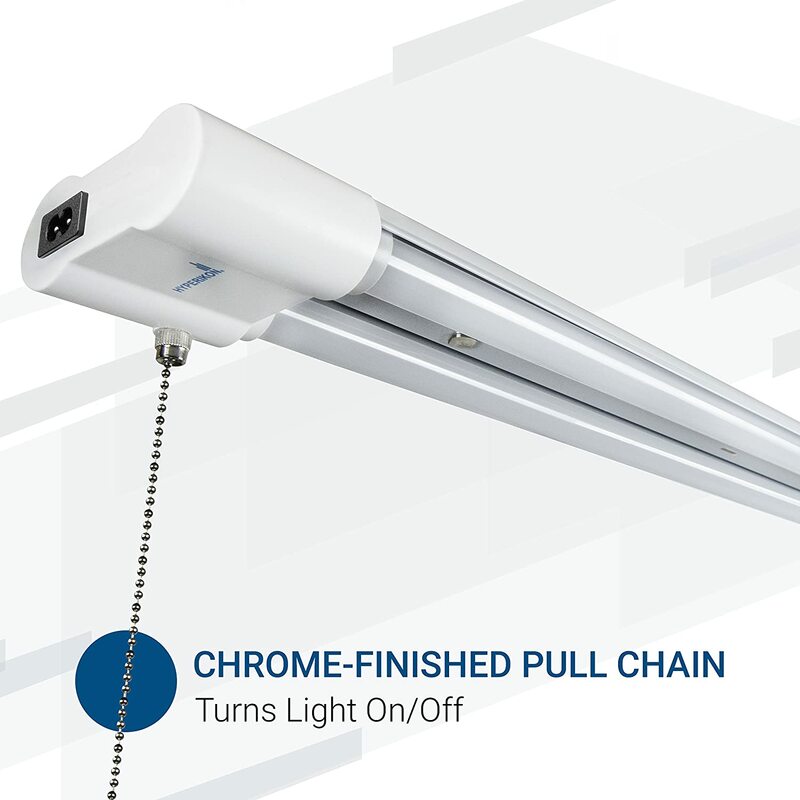 Hyperikon linkable garage lights offer chrome-finished pull chan to turn light on/off. The Hyperikon LED garage lights provide long life, high performance and energy savings in a simple fixture. Thus, this makes it perfect for utility and recreation rooms, garages, basements, work areas, and workshops, etc. The Hyperikon HyperSelect 4ft. LED garage lights feature on our best LED garage lights list as it helps to lower your electricity bill and conserve energy. By replacing your old fluorescent fixture with Hyperikon HyperSelect 35W LED lights, you can save a lot of money. These garage lights have a life of 45,000 hours thus ensuring that replacing garage lights is a thing of the past. 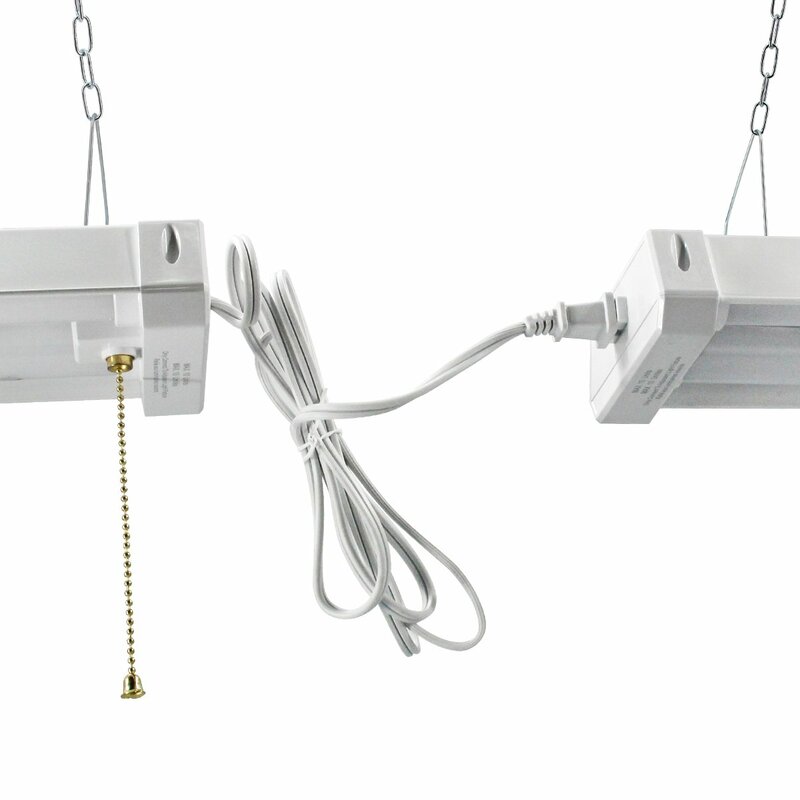 The Hyperikon HyperSelect can be flush mounted or installed as a hanging light fixture with adjustable height. The Hyperikon HyperSelect illuminates your workbench and garage with the best lighting possible providing an incredible minimum of 108lm/watt. This makes them perfect for barns, storage rooms, garages, warehouses, utility rooms, and workshops, etc. 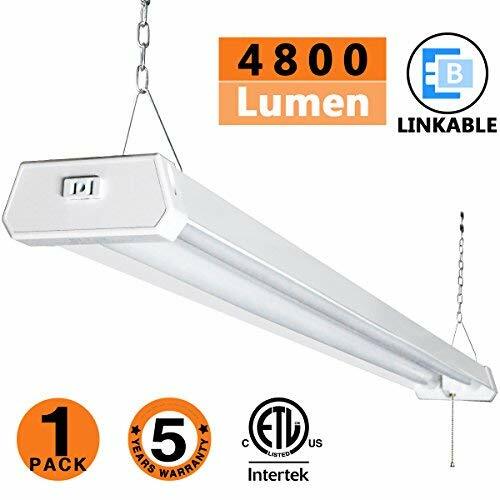 Bottom Line They are suitable for different areas such as garages, workbenches, warehouses, etc They are perfect for use in various places such as garages, auto shops, laundry rooms, They are ideal for both commercial and residential lighting. The brightness of a bulb is measured by lumens – the higher the lumens, the brighter the bulb. Usually, a light that has 3500 lumens will be ideal for your garage. Therefore, consider the lumens before buying a garage light. Saving energy is one of the top requirements for the best LED garage light. It is important for both you and the environment. LED lights consume 60% less energy as compared to the conventional lighting systems. When looking for energy efficient garage light look for one that holds the Energy Star certification. A bulb with a good lifespan is a better option as it will last longer thus resulting in low maintenance costs. The size of the garage lights that will fit your requirements perfectly depends on the size of your garage. A normal garage requires three to four lights, but this number could be less depending on your garage size. Some garage lights do not come with complete and clear instructions which could cause damage to your product during installation. It is best to look for a product that comes with chains for hanging or is easily mountable. Moreover, make sure that your product comes with all the required accessories needed for installation. This depends on your preference. Some people prefer pull-down chains while others find plugs to be the better choice. Garage lights that have a Kelvin temperature ranging between 4000 and 7000k are the best LED garage lights as their brightness is more like the sun. Anything lower than this range is not good for your eyes as it puts a strain on them. It is also important to consider the housing of the garage lights as it keeps them durable and safe.